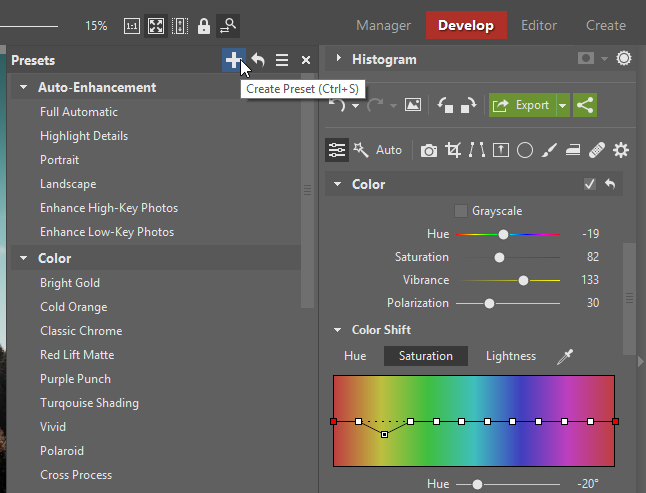 Presets are predefined settings for photo-editing tools. They let you edit photos in a single click. 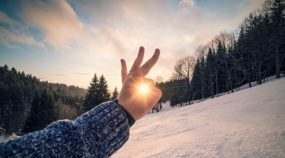 How do you create them, save them, and use them in ZPS? I’ll explain all of this through a simple example: toning pictures towards teal and orange, which has become a very popular edit lately. 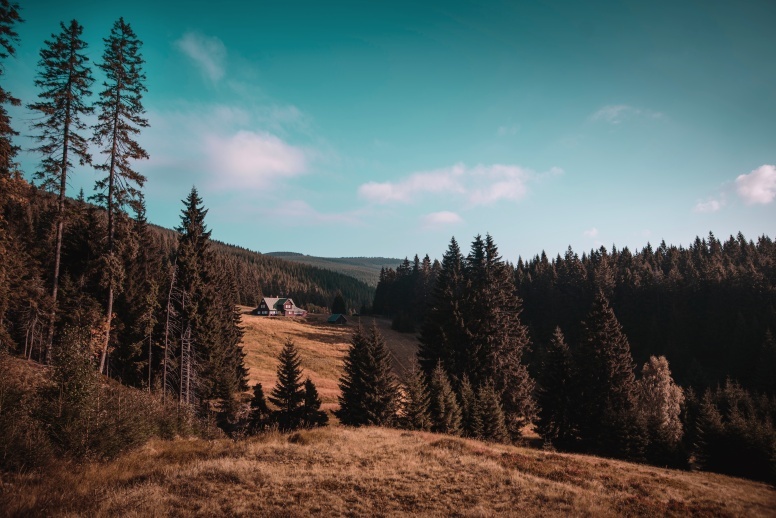 I’d like to invite you to download the sample picture (or use a similar one of your own) and follow along to learn the steps. But Wait, Why Teal and Orange? If you’ve been following recent cinematography, you’ve likely noticed that in almost every recent film, the blues are shifted towards teal, and they are very often used together with orange. 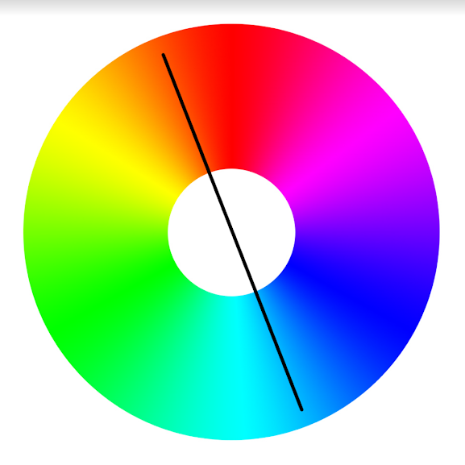 This works well, because these are colors on opposite sides of the color wheel, and so they form a contrasting pair. Red and green could work the same way, but if a scene needs to contain, for example, someone’s face, then orange is more useful as it’s a more natural skin color. Colors opposite each other generally form interesting color compositions. So my goal is to create a Teal and Orange preset, and I’ll be setting it up while working with this photo here. That means that I’ll be shifting the green of its trees towards orange, while shifting its sky’s blue towards teal. The photo whose colors I’ll be changing. I open the photo in the Develop module and go to the Color section in the right panel. I start by testing some shifts in its overall tinting towards different values. That way I can see how the picture’s different colors work and how the changes I’m making affect them. Here I’m aiming, of course, to produce a teal-and-orange take, and so I’m shifting the hue lightly into the negative values. Now, this does change absolutely all of the picture’s colors, including those I didn’t want to change. But I’ll fix that in the next step. I also found here that it helped to increase the Vibrance and decrease the Saturation. For now, I’m going to feel free to deliberately overshoot a little. Shifting the Hue for all of the colors. In this step, I’m making some small adjustments for colors that I’ve shifted accidentally. The original orange is too far towards red, and so by moving it upwards, I’m returning it towards what’s normal. For the very next color, yellow (which often appears in greenery in photos), I do the opposite: I move it downwards, more towards orange. I make the blue sky more teal by shifting all of the blue shades from blue out to indigo downwards. Moving on and fine-tuning colors individually. If it seems like a color is too saturated, I click into the Saturation setting and decrease it. Then fixing their Saturation as well. Now that everything’s done, I click the Presets icon at the top left of all of the controls in the right pane, and then the + button at the top of the Presets controls. The + stands for Create Preset. I can use the Ctrl+S keyboard shortcut as well. Now I name it and set where to save it. Naming the preset and confirming the name. In the next step, I set which tools to include in the preset. While I could include every single tool, the more tools a preset has, the less universal it is. So I limit my color-tuning preset to just color settings, and I recommend you do the same. 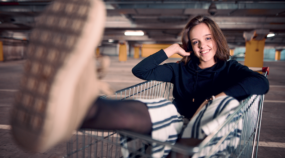 I also have presets for landscapes and for portraits, and so on. Choosing the individual tools for the preset. So for a landscape photo, I first apply my Landscapes preset with some settings (mostly exposure) for landscapes. 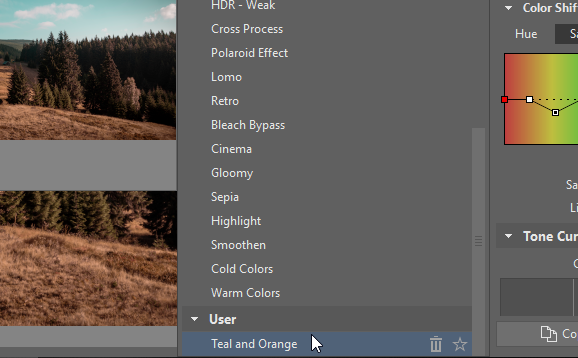 Then I use my Teal and Orange preset if I wish to shift its colors towards teal and orange. 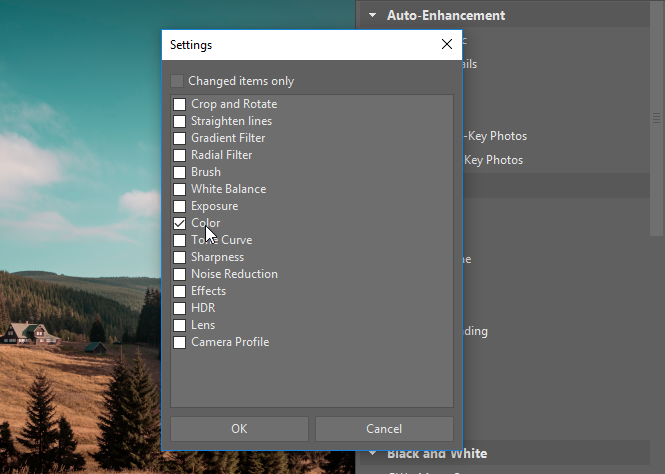 It’s just one click more, and it saves me—and can save you—lots of time and work with fine-tuning other settings if I end up also using my preset for a genre other than the one I originally created it for. 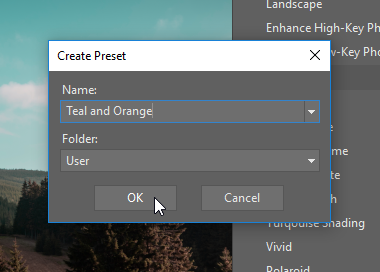 To use my preset, I open the presets panel and click on the preset’s name. Running the mouse over its name previews it. Using a preset in a single click. 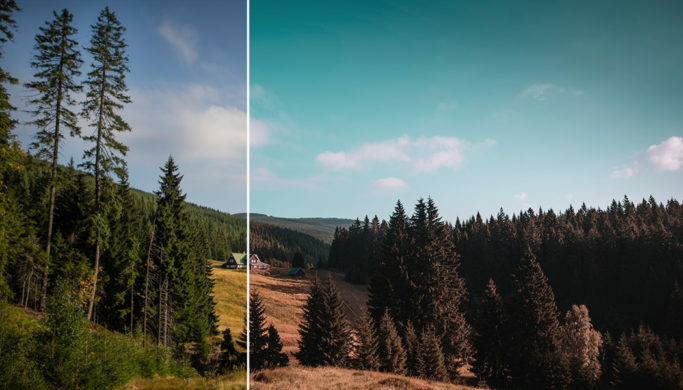 The photo before and after applying the preset. 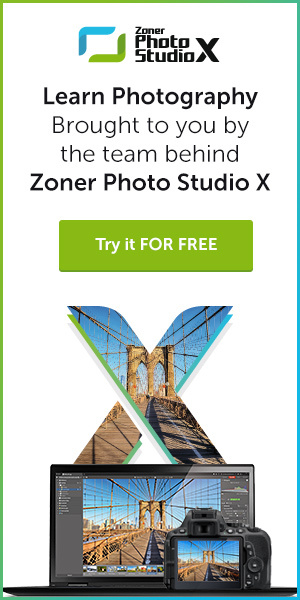 Download Zoner Photo Studio X, enjoy it 30 days for free, and edit photos lightning-fast with presets.